One day in January, on a walk in the park by the river, I was puzzled to find tree trunks wrapped in blue and white striped canvas. Then the stripes appeared on the Euromast tower, on flags, on banners, on posters, even wrapping the ears of the large bronze rabbits on the lawn outside the Natural History Museum. They were everywhere – blue and white stripes. One day, the penny finally dropped…. 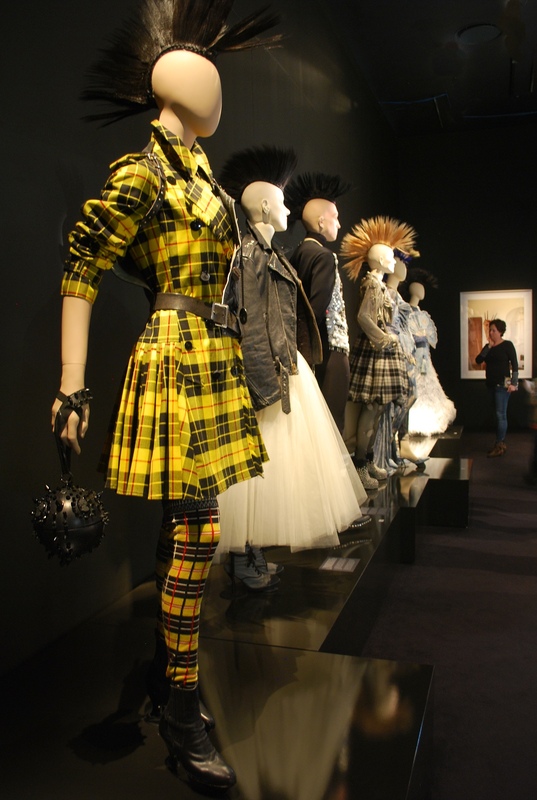 My familiarity with haute couture does not really extend much beyond Patsy and Edina of Absolutely Fabulous, so when I realized that the stripes were all about Jean Paul Gaultier at the Kunsthal, I was not curious enough to join the queues when the exhibit opened in February. I probably would never have made the effort at all, but passing by on a chilly Friday afternoon in April, I felt cold and noting the lack of queues, I suggested to my companion that we find out what the fuss was all about. The first surprise was the use of video projection and audio to create animated mannequins among the regular articulated, blank-faced dolls. The mannequins were looking around the rooms, carrying on philosophical monologues, singing and talking to each other, in French and English. It was incredibly clever, enormously entertaining, and made everyone smile. 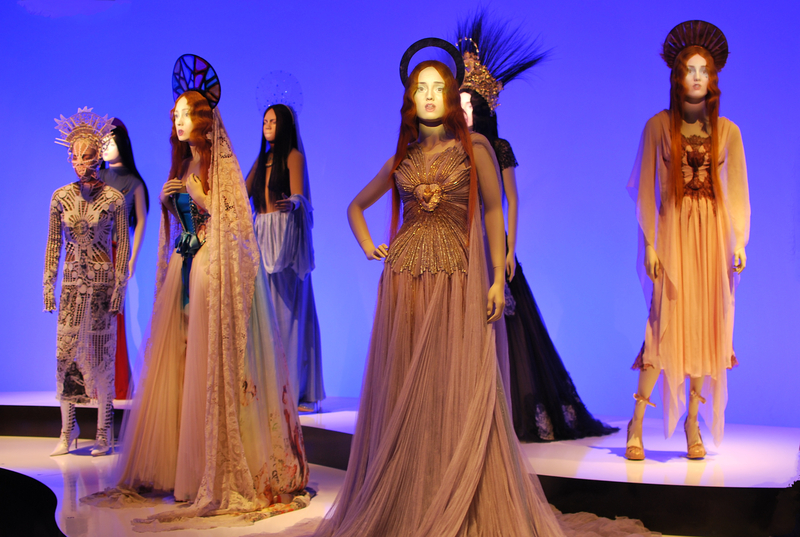 The second surprise was Gaultier’s breathtaking imagination and humour. Sure, it was the haute couture and prêt-à-porter that graces the catwalks in Paris, favored by the likes of Madonna and Lady Gaga, but it was also the most fun I had all winter. 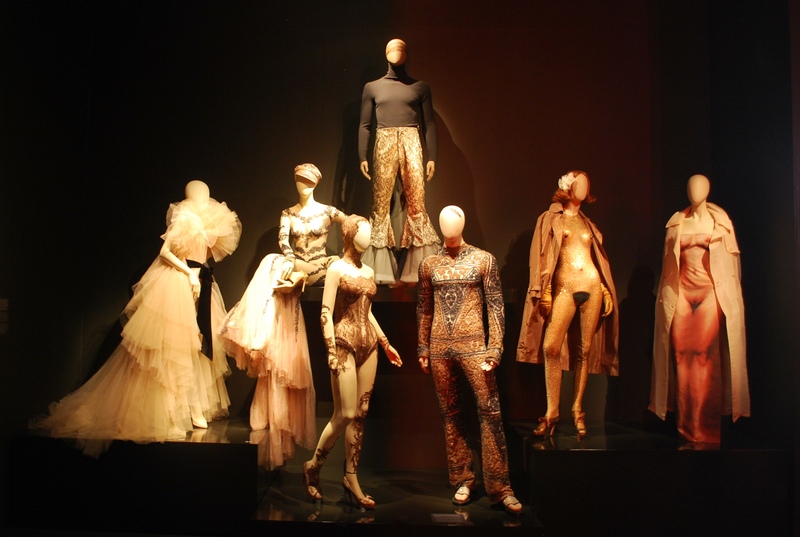 This quote from the introduction to the exhibit is an excellent summary of The Fashion World of Jean Paul Gaultier: From the Sidewalk to the Catwalk. Underneath Jean Paul Gaultier’s wit and irreverence lie a true generosity of spirit and a very powerful message for society. Beyond the technical virtuosity resulting from exceptional expertise in the various skills involved in haute couture, an unbridled imagination and ground-breaking artistic collaborations, he offers an open-minded vision of society, a crazy, sensitive, funny, sassy world in which everyone can assert his or her own identity, a world without discrimination, a unique “fusion couture.” Through his fashion, he demonstrates that everything is possible. I was captivated and ended up going three times before the show closed on May 12th, which is why there are 34 photos in the gallery below. Click on any of them to start the slideshow and enjoy! UPDATE: Lucky enough to be in Sweden this summer? Catch the show at the Swedish Centre for Architecture and Design (Arkitektur- och designcentrum) in Stockholm from June 15 to September 22. Boka biljetter här. getting your companion to smile… is that challenging? ?